Are you already experiencing the rugged versatility of the AirDome Canopy but need some more protection from those invasive UV rays and rain drops? It can be hard to keep the sun and rain out of your tent, but The Vitabri Awning for AirDome Canopies might be the perfect accessory to help. The awning is made of a durable 600 denier polyester material that is intended to last through harsh outdoor conditions while you remain protected inside the tent. 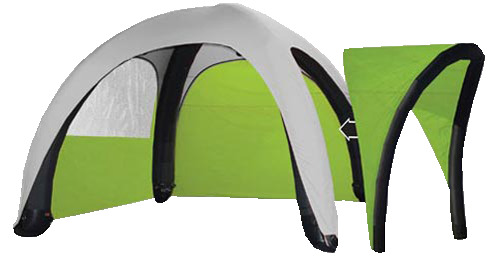 The polymer coating on the material provides excellent protection from the elements, and the awning is easily folded and stowed with the rest of the tent. Available in 3 different sizes.